Fagbenle mustered 15 points (7-8 FG, 1-1 3Pt), four rebounds, one assist and one steal during the 75-68 loss against the Sparks on Tuesday. Unexpectedly, Fagbenle had a terrific game in the playoff loss Tuesday, erupting for 15 points on a spectacular 87.5 percent mark from the floor. The 26-year-old was a late bloomer this season and finished the year averaging 3.1 points and 2.0 rebounds across 30 outings. Fagbenle (quad) returned from injury Friday to post four points (2-5 FG) and two rebounds across 10 minutes during the 83-72 victory over the Mercury. Fagbenle saw no more than five minutes across her first five appearances of the season, but has now seen double-digit minutes in three straight games. Across those three tilts, she's totaled 14 points, six rebounds, two assists and one steal in 32 minutes. Fagbenle is out for Tuesday's matchup against Dallas due to a quad injury, Tyler Mason of The Athletic Minnesota reports. The injury comes at an unfortunate time for Fagbenle, who had her best performance of the season during the team's most recent tilt, dropping seven boards and adding three rebounds in 10 minutes off the pine. Her next opportunity to take the floor arrives Friday against the Mercury. Fagbenle (personal) returned to the lineup for Saturday's game against the Liberty, posting seven points (3-4 FG, 1-1 FT), three rebounds and an assist across 10 minutes. Fagbenle had missed the previous two games while tending to a personal matter, but rejoined the team for Saturday's contest. She ended up seeing the floor for 10 minutes, which allowed Fagbenle to score a season-high seven points on 75 percent shooting from the floor. Despite being healthy, Fagbenle typically doesn't see enough time on the court to be considered for DFS purposes most nights, so she may need an injury or two ahead of her on the depth chart to become relevant. Fagbenle (personal) remained out for Saturday's matchup with the Sun. Fagbenle is currently dealing with a personal matter and has now missed each of the last two games. The Lynx haven't provided any sort of timetable for her return, so for now, she'll continue to be evaluated on a game-to-game basis. Tentatively consider Fagbenle questionable for Saturday's tilt with the Liberty as well, though she'd likely only play a minor role if cleared and isn't an overly intriguing DFS option. Fagbenle is tending to a personal matter and has been ruled out for Thursday's game against the Mystics. The specifics surrounding Fagbenle's situation are unclear and with the Mystics playing again on a short break Saturday against Connecticut, there's a chance this ends up being a multi-game absence. Fagbenle saw her most extensive playing time (12 minutes) during Sunday's contest, but had previously logged five minutes or less in five straight games, so her absence shouldn't have a drastic impact on the regular rotation. Fagbenle entered the All-Star break averaging just 3.9 minutes per game. Fagbenle has seen action in 13 games so far this season, but has yet to see more than seven minutes in a single contest, which keeps her fantasy value severely limited. The rookie center will likely spend the rest of the season in a developmental capacity, with the hope of becoming a fixture in the regular rotation during the 2018 campaign. Fagbenle has yet to play more than seven minutes in a game this season after 10 outings for the Lynx. A 25-year-old rookie, Fagbenle still has a lot of acclimating to do before she's considered a legitimate option in regards to fantasy. Since the Lynx currently posses the best record across the league, a sudden rise in value isn't to be expected in 2017. Selected by Minnesota in the 3rd round (35th overall) of the 2016 WNBA Draft. Finished her rookie season in the WNBA, seeing action in 21 games while drawing 13 DNP-CDs… Averaged 1.2 ppg and 1.0 rpg in 4.2 mpg while hitting 50.0% from the field and 77.8% from the FT line… Contributed six points Aug. 25 at San Antonio, and registered season highs with three rebounds and two blocks Aug. 22 vs. Phoenix… The point (six), rebound (three) and minute (11:40) totals Aug. 18 vs. Indiana were all season bests… Made her WNBA debut May 14 vs. Chicago. 2017: Appeared in two playoff games, totaling four points and one rebound in four minutes. A 2012 Olympian for Great Britain, averaged 4.8 ppg, 4.0 rpg and 1.2 bpg while playing 20.0 minutes at the London Games… Appeared in all five games for Great Britain at the 2012 Olympics, including starts against Australia, Canada and Russia… Was just the second Ivy League women’s basketball player in history to compete in the Olympic Games… Named England’s 2010 U18 Player of the Year… Won the 2010 U18 Women’s European Championship with England, standing as the tournament leader in five statistical categories including rebounds, double-doubles and two-point field goal percentage… Named MVP of the Blue Star Europe Tournament in 2011. 2015-16: A team captain and full-time starter, the 6-4 post player earned a spot on the prestigious All-Pac-12 Team and earned Pac-12 All-Defensive Honorable Mention selection and recorded 10 double-doubles. Led the team in scoring (13.6 ppg), rebounding (8.7 rpg), blocks (1.2 bpg), steals (1.8 spg), free throws made (93) and minutes played (30.3 mpg). 2014-15: An All-Ivy League Second Team selection in her final season at Harvard. Started in all 28 games played and averaged 14.4 points, 10.4 rebounds, 2.0 assists and 1.0 blocks per game. Posted 13 double-doubles and ranked first in the Ivy League and 37th in the country in rebounds per game (10.1). Scored 23 points and grabbed a program record 24 rebounds against Temple. Neared a triple-double with 28 points, 12 rebounds and seven assists vs. Brown. 2013-14: An All-Ivy League First Team selection. College Sports Madness Preseason All-Ivy League First Team. Three-time Ivy League Player of the Week (November 25, January 13 and March 3). Two-time College Sports Madness Ivy League Player of the Week (November 25, January 13). Named to ASU Classic and Fordham Holiday Classic All-Tournament Teams. Averaged 13.3 points and 9.3 rebounds per game in 29 games started. Led the league in rebounding, field goal percentage (.548) and defensive rebounds (6.5). Ranked second in the Ancient Eight in blocked shots (1.4). Posted 11 double-doubles. 2012-13: An All-Ivy League Second Team honoree and Ivy League Rookie of the Year. Set Ivy League record as a 10-time Rookie of the Week winner and named to San Diego Surf ‘N Slam Classic All-Tournament Team. Recorded her first career double-double with 13 points and 10 boards at North Dakota. Scored a career-high 26 points on 11-of-14 shooting along with 13 rebounds at Penn. Had a career-high four blocks against SMU. 2011-12: Sat her first year in residency at Harvard. 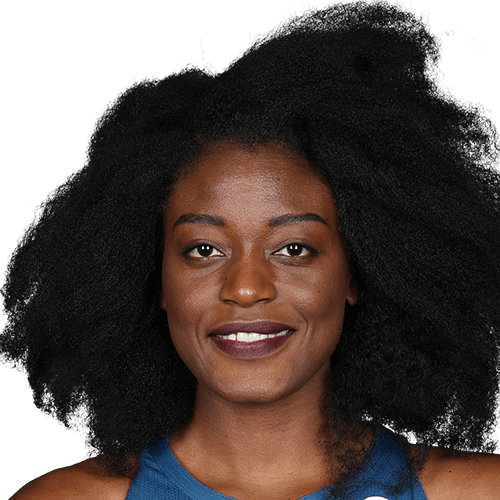 Born Sept. 8, 1992 in Baltimore, Md.… Lived the majority of her life in London, England… Daughter of Buki and Tunde Fagbenle… Has 11 siblings, Kunle, Dokun, Banke, OT, Luti, Dapo, Tito, Pekun, Torera, Tife and Tani… Dapo played basketball at Campbell and Bellarmine… Her family now lives in Ibadan, Nigeria… Says stepping into Olympic Stadium as a member of the British Olympic Team was her most thrilling sports moment… Enjoys reading, listening to music, biking, eating Nigerian food, singing, dancing and sewing in her free time… Lists Roger Federer as her biggest sports hero… Hopes to travel to every African country… Would like to get involved with creative and artistic modeling, and hopes to pursue an acting or singing career… Received her master’s degree in strategic public relations at USC.